A brief report on the latest purported inflation figures. rhetorical tripe on monthly inflation figures today from the BLS. most inept, reality-TV, stupor-induced American. feed you and your family and fill up the old gas tank. is now at $3.83, up from $3.54 a year ago. That’s an 8.1% Rise. How about from last month? Prices from February are up a hefty 12%. only risen 0.4%. How can that be? Simple, one word. Deception. Fish and eggs are up on a weighted basis of 7.21% from a year ago. 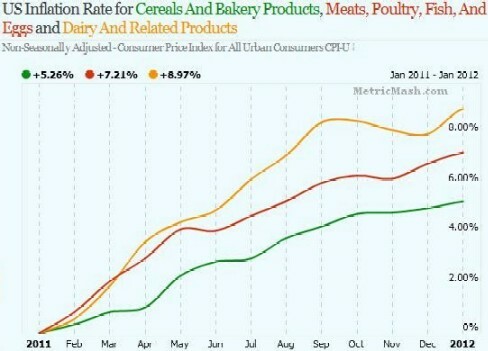 last year, while Cereal and Bakery products are up 5.25% from January ’11. 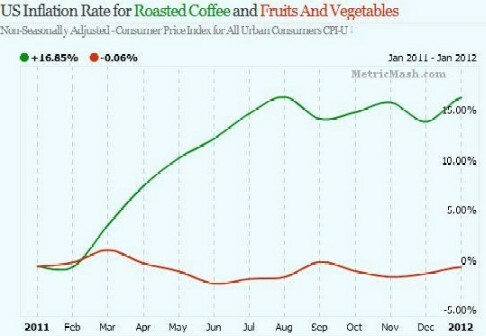 Well, roasted coffee prices have soared a whopping 16.85% from January 2011.
dropped about a half a percent, 06% to be exact. is NOT true. The government is playing a game, a dangerous game at that. The BLS has truly become a Ministry of Propaganda for the government. in a campaign of utter and sheer deceit on jobs data and inflation. Making a mockery of the Statistical arm of academics and public trust. U.S. gasoline demand has dropped to a 12-year low, yet consumers are paying the highest-ever prices for this time of year. The reason: Rising global oil prices are in the driver’s seat. The paradox isn’t limited to the gasoline pump. Home-heating oil users will see record-high bills, despite using less fuel, according to an Energy Information Administration forecast. Diesel fuel prices are up 25% from a year earlier at record November levels, fueled by a powerful one-two punch of surging demand both in the U.S. and abroad, the EIA and analysts added. 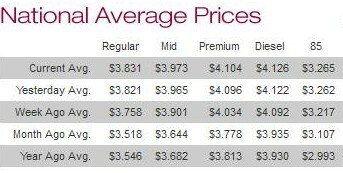 Prices for gasoline, diesel and heating oil are determined by global demand and worldwide crude prices. That notion is sometimes lost, with the emphasis misplaced on the U.S. benchmark.